LONDON, England (CNN) -- The world's richest people are spending millions arming their super-yachts with military-style technology and trained personnel to fight off potential attackers. 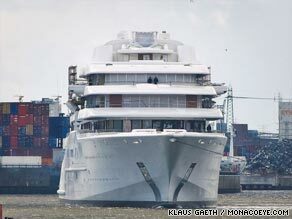 At $475 million, Roman Abramovich's mega-yacht "Eclipse" is said to be the most expensive in the world. The threat of pirates and growing fears that yachts may be their next target have led many owners to equip their vessels with the latest James Bond-like technology. Hidden chambers, escape pods, tracking devices and ex-marines employed as security guards have all risen in popularity. "It is only a matter of time before pirates move from cargo ships to attacking super-yachts cruising near Somalia," Michael Howorth, former super-yacht captain and technical editor at SuperYachtWorld magazine, told CNN. "Many pirates do not yet appreciate the importance and potential value of these yachts." Howorth and other experts also believe piracy is no longer an issue confined to the Gulf of Aden -- the waters off the Somalian coast where most recent incidents have taken place. For many, yacht security is becoming a worldwide concern. As a super-yacht owner, "you would be an absolute fool if you didn't have this sort of [advanced] technology," according to Howorth. The average super-yacht is worth $1 million per square meter, according to the calculations of some experts, making them tempting prey for pirates. "You can at least double that if the yacht carries huge amounts of cash, artwork, furniture, boats, valuable and attractive items," said Paul Cook, non-executive director of JCB security, which provides yacht-owners with "non-armed" security guards with strong military backgrounds. One of the most extreme and, well-publicized examples of this trend is, "Eclipse," the 160-meter (525-feet) super-yacht being built by Russian billionaire Roman Abramovich, owner of the Chelsea football (soccer) team. Costing a cool $475 million, according to figures quoted on the Web sites of Russia's Pravda newspaper and UK newspaper The Guardian, Abramovich's yacht will be the most expensive in history when completed. It has a militaristic appearance, spurring rumors in the UK press that Abramovich is installing military-grade anti-missile defense systems aboard the vessel. While these reports remain unsubstantiated, it is clear that technology used by the world's most advanced armies is now available for super-yacht-owners. ProForm Marines is one company that offers military-grade defense and surveillance systems for yachts and trains former Royal Marines as security guards. One of the defense systems ProForm offers is called L-RAD -- a long-range acoustic device so deafeningly loud that when it is directed at attackers, it can force them to retreat. L-RAD is one component that can be added to the $450,000 "SeaOwl" tracking system. It is "a system that combines radar and infrared/thermal imagery cameras to detect incoming threats as far as 5 kilometers away, even at night or during foggy weather conditions," Paul Kerr, ProForm CEO, told CNN. Despite these advanced tools, many yacht owners are preparing themselves for the worst. The possibility that pirates could get on board and take the crew hostage has led many yacht-owners to build "citadels" -- panic-room-style chambers that are virtually impenetrable and have enough food to last several weeks. Paul Cook, from JCB security, also a captain on a yacht belonging to a Russian billionaire (whom he declined to name, citing client confidentiality), told CNN his employer had converted a hidden chamber on his vessel into a citadel. "We put food and water in there, telephones, radios and decided the girls would hide there if it was ever necessary," he said. Even more extravagant is the "escape pod" -- a submarine that is ready at all times to ferry those on board away to safety. Many of the big yachts, such as Microsoft co-founder Paul Allen's "Octopus," have submarines on board. Expert Howorth said he believed these subs could also double as escape pods. "This function could not have escaped designers' minds when they created the submarines," he said. Fraser Yachts, a Monaco-based yacht-chartering company, has submarines available for clients who charter super-yachts. Fraser Yachts would not confirm whether these submarines double as escape pods for some clients. "Most of our submarines are there as a leisure addition to the yachts ..." Clive McCartney of Fraser Yachts told CNN. "This is the ultimate luxury business and we'll do anything our clients ask us to do." Yacht owners can also employ intelligence-providing companies to help them plan their routes to avoid trouble hotspots. Dryad Maritime Intelligence was formed by Graeme Gibbon-Brooks, a former naval officer with experience in counter-terrorism and underwater sabotage. Gibbon-Brooks now uses his specialization in asymmetric warfare -- battles between large vessels and small terrorist boats -- to advise rich clients on the dangers lurking in the world's oceans. "The general feeling is that piracy will increase around the world," Gibbon-Brooks told CNN. "In the Mediterranean, we saw two recent attacks on yachts, one last month in the bay of Naples." "That is why, while there has always been a market for intelligence, security and technology, every yacht owner now understands they have to take precautions."